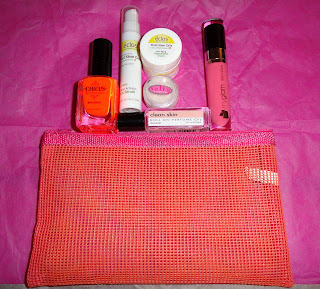 Total value: $32.44 before Glam Gloss and Makeup Bag! Initial Thoughts: I am a little torn on this box. Normally I would be thrilled to get nail polish, BUT this is the second month in a row we have received a brand that one of MyGlam's stylists is getting ready to launch. That seems cheap to me. Plus, the colors are hideous, it is a massive amount of packaging (so not green) and it stains your nails and chips badly from what I have heard. Also, the roll on perfume oil smells like cotton and moth balls aka old people. That is not a scent I will ever wear. The best thing in the bag was actually the MyGlam Glam Gloss. It has a wonderfully angled applicator for easier application. It looks great and tastes like strawberries. I wish we could buy them from MyGlam. I also think I will like the eclos products. Anti-aging stuff is always great and I have been wanting to try them. The Salty Mineral Eyeshadow is actually very pretty too. It is a pearly color. Overall the stuff that I love is valued at way over the $10 I spent & hopefully I can sell/trade the perfume oil and nail polish. Any takers? Initial thoughts: Hand soap...really Birchbox, really? Why must you continue to send me lame and disappointing things like ziploc bags and hand soap? I would have probably liked this box better without it. I was really excited for the DDF Brightening Cleanser and I was right to be. It is amazing and I would probably never try it otherwise. The razor is kind of a *shoulder shrug* item. I will use it, but I have used Hydro Silk before and I was not impressed. I prefer Gillette Fusion razors (guys razors are SO much better than ours). The Juicy Couture smells great, but I am sick of perfume samples. The Per-fekt Lash Gel really excited me, but I was a little bummed to see how small of a sample they sent. Plus, it already had massive clumpage on the end of the wand when I first pulled it out. I didn't exactly hate this box, and I saw plenty that were a lot worse. However, the DDF is the only thing I LOVE. Even when Birchbox disappoints me, they are still worth the $10. This months winner: MyGlam. They finally beat out Birchbox, but not for the right reasons. I didn't love everything in either box, but MyGlam has more things that I will use again and possibly buy. The Glam Gloss really put it over the top and made it worth it to me. Better luck next month Birchbox. I got a different shade of Glam Gloss than you. Mine's brighter pink and tastes like watermelon, but I think I'd prefer the one you got. I don't really think the Demeter perfume oil smells like old people, but it's not a scent that everyone will love, for sure.